How do you get your business flying? One thing that can be proven by analysis across many companies is that despite periods of loss, a good return on shareholders' funds (ie returns after salaries) can be quite sustainable. Australia's highest performing businesses largely follow similar success guidelines to average over 35% ROSF (Return on shareholders' funds) in any five-year period. And they only drop out of this elite list when they are taken over, abandon the success guidelines with new CEOs or board members, or have been found to have dodgy accounting (rare, but happens.) In the last five-year period, the weighted average ROSF was a staggering 57%. 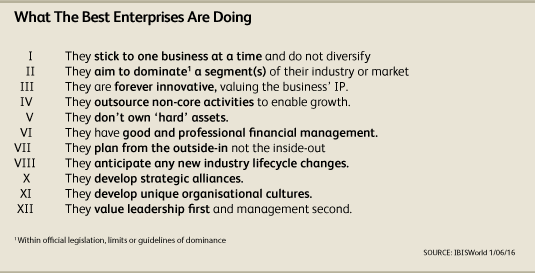 What this infers is that often there may be no such thing as a bad industry only bad management. This will determine the value of your business today, with a mind of increasing its value to the level you decide. Next time you think about the value you want to extract from your business, call us and we will lead you through the analysis and the potential uplift it can bring.